It is an unofficial, fan made, total conversion (TC) project set in the SciFi Universe of Warhammer 40.000. It is a project X3KJ started in earnest about 3 years ago, though some precursor work dates back 5 years. The purpose of this project is to portray a particular made-up conflict (the Samarsk Uprising) between soldiers of the Imperium and Chaos Renegades in the 40k Universe in the most believable (IRL and "in universe") and immersive way possible. At the same time, staying true to the established lore and design as close as possible is of paramount importance. X3KJ: "As a long time 40k fan and collector (half of my life at present to be precise) and modder i always wanted to do a game mod for it eventually. When i played the Arma 2 warfare game mode the first time i knew exactly that this was the perfect environment for such a project. I’ve read various Black Library novels and a couple of Forgeworld campaign books along the way. The attention to detail in these is incredible, something that official 40k games and unofficial mods have not yet been able to capture in any way. With this project I aim to do precisely this - capture the detail you could expect from a good novel/ short story/ movie inside a real scale environment. This does mean however, that the scope that the mod can cover is limited." What is the currently planned scope of the Project? Instead of a generic “40k mod”, this TC will deal with one particular conflict, the Samarsk Uprising on a mining world in 544.M41. It is an invented conflict, to not step on the toes of official background and to have some creative liberties. The plot (which hasn’t been developed very much atm., but will be refined and iterated as the project goes) has the purpose to provide immersion, context and stronger inspiration for the people working on this project - and maybe also for players themself. The conflict is between the Imperium of Man and the Chaos Renegades, with the planetary defense forces in the middle of it. Xenos (“alien races”) involvement prior to completion of the current scope is not planned - it would result in less productivity when resources are spread thin. Also, it's a nice break from the "standard 40k video game plots" which repeatedly end in some cesspool of a plot where they try to sell us that 4+ races/factions all are after the same thing on this single planet in the universe. This is not a mod that tries to gobble up all that somehow represents 40k by all means possible. A good, highly detailed and consistent standard of quality is the goal. Also, the gameplay will not be simplified or “arcade-ified” over vanilla Arma 3. Quite the opposite is the case - when it becomes necessary/ makes sense, certain areas will be made more detailed and refined compared to vanilla, without making it cumbersome or difficult to use however. When attemtping to work on such a project in a team it is important to establish guidelines of how things look, feel, function etc. This is crucial, otherwise (talking from experience) there will be no consistency and many discussions will surface about trivial things - which mostly just produce nothing but hot air. Finding a common denominator is very difficult, especially when a scifi IP which has never really payed attention to finer details, is transformed into something more realistic. Ask 10 fans about how 40k should be like in (somewhat) realistic terms. You will get 10 different answers. Various playable assetts (tanks, hand weapons, imperial guard uniform,...) are the result of this work, including many more WIP models. Now, with the foundation established (by example, not by word) the playable content needs to be refined and extended to get at least two player factions together for a first release. Effects need to be created (visual and audio) and the environment needs to be designed and created, which includes structures, prop models, and a map/terrain. Furthermore we are looking to add gameplay features which complement the 40k setting and create new solutions to get around certain restrictions of Arma. Terrain makers, Modellers, Texture Artists, Concept Artists (2D or 3D), Scripters, Config Coders, Audio Artists, VFX Artists, Animators, Mission Makers, Writers, etc. You don’t need to be a professional, but a certain minimum experience in your chosen field(s) is necessary, as we don’t have the manpower/time to teach you from the ground up yet. If you're unsure, just ask. We also have a need for a data server (e.g. a SVN or Git repository). If you can help with providing one and/or administrating/ setting one up, it would be most appreciated. Please don’t ask being alpha/ play tester, unless you can also work with configs to help fix or implement things yourself. We will announce when we need dedicated testers. There is no que or reserve slot for beeing play tester either. We asked our crystal ball, but it engaged self-destruction - simply put: Impossible to tell right now. We are always excited when we can show new stuff, so you can be sure to hear about it when there will be a timeframe for a release. Until that is the case, please be patient. Some may wonder if this will fail like the other 2+ attempts of other groups at a W40k mod for A3. Who knows, we are not farseers. However, this idea isn’t just a brainfart from yesterday, and we know from experience how demanding and challenging a total conversion is. X3KJ for example worked 5 years on modding X3:Terran Conflict prior to this project, 3.5 years of that on the "X-Tended: Terran Conflict" total conversion. Q: Will this be for everyone or will it be limited to only few select servers? A: As stated in the first few lines, this project is strictly non-profit. Therefore, it will be available for every server owner. I have a strong distaste for “server-exclusive” mods anyway. Servers using this mod will not be allowed for monetization. Q: When do you consider a first release? Intentionally vague answer: When two opposing factions have enough content completely finished and enough variety to enable smaller combined arms land based encounters. That means a bare minimum of copy pasta placeholders, no unoptimised models/scripts, etc. A small thematically fitting “demo” terrain is also a condition at this time. Q: Will it require DLC? A: No, at this point. But it may change depending on the development of our terrain/ terrain assets and BI’s policy for using for example textures and vegetation from a DLC in a mod. However, we will only use DLC content if there is a very good reason to do so. Q: Will there be Astartes? A: Using a regular human skeleton for them is definitely out of question. Creating fully functional characters with custom skeletons in arma is a big pile of work however. If we can find an animator and config coder able and willing to create and implement a gigaton of animations to enable custom characters with a custom skeleton worthy of an Astartes, then the answer would be yes. Everything else (model of character, armor, etc) are childsplay compared to that. Q: Will there be Titans? A: Unlikely, due to too large scale for gameplay and animation work involved (requires custom skeleton with all custom animations - less than for Astartes though). Not impossible but simply too low priority compared to most other things. Q: You know there is another 40k Project, right? A: (X3KJ) "Yes indeed. I've been in contact with them quite early on. They focus less on individual detail or super-realism (compared to my goal) and instead more on variety. I can totally respect that, since not everybody has the nerve to go into as much detail/feels the need to do it as i do. We both came to the mutual conclusion that it just would look completely wrong when having units from both projects side by side due to the stylistic differences. Still, there is room for collaboration (sound or effect department for example). So if you where wondering - no this is not a result of some silly rivalry or personal drama. Just different goals. Also, i was first to start working for A3 :D"
Hello all, i wish you a merry christmas. Before i start with content, i'd like to get this of my chest: Please note that this mod needs more helping hands. We are currently 2 people and the tasks are daunting in their number. Despite the shiny ingame pictures you see, under the surface there is a big amount of work in all fields of modding and editing left to do (including basic image and text editing, writing, ...) , before a first release will be feasible. If you have time to spare and are willing to help, contact us (preferably on discord). Over the last months the foundation of buildings/structures was beeing gradually explored. Concepts and experiments for the look and feel of buildings on the chosen planet, what metrics are necessary for them to function as desired and how to create a model system that allows time effective creation of many assetts. This is quite a complex topic, which is a bit too much to go into full detail here. Part of the concepting also involved defensive structures (walls, fortifications, ...). With this mod's focus on functionality and believability, the structures must fullfill realistic requirements just like any other object. This means it needs to be considered which weapons they would have to withstand, and what weapons would possibly be used from inside them. However, there was a big undefined gap between infantry mortar and Basilisk which needed to be filled first, before any work could resume on defensive structures. 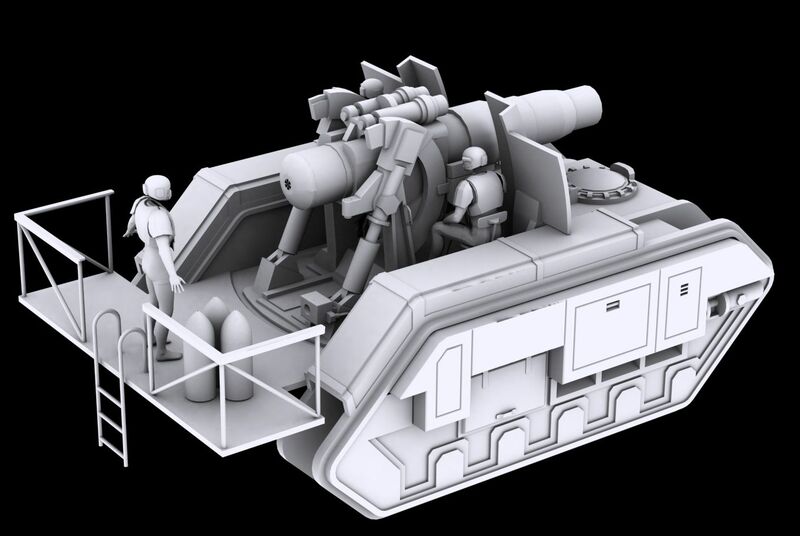 Here are early WIP images of 3 artillery weapons that resulted from this concepting - Medusa Siege Gun, Heavy Mortar and Quadlauncher on field gun carriage (inspired by DKoK models, but carriage is a custom pattern). The Quadlauncher sits in the middle between Heavy Mortar and Infantry mortar, at least in the TT rules. It is essentially a four barreled medium mortar, if background and TT rules are fused together. A single tube Medium mortar is not known in the background or TT, but would make a lot of sense from a logical standpoint. Same munition as quad launcher, easier to relocate and transport. Once the Centaur is complete (currently on hold because of Physx issues...), a variant with medium mortar installed would propably be very usefull. The current roadmap for structures is, to start with defenses (pillboxes, walls, vehicle obstacles) to provide first real gameplay opportunities, even on a relatively flat and barren map (which also needs to be created, still). The fortifications are designed to be more realistic, so they are harder to take out. There will be no huge 1m x 5m gaps for "firing slits". This is why defense buildings with different fortification levels (wall thickness) are planned, to allow for flexible scenario creation. After all, not every scenario should require a Medusa Siege Gun or human wave tactics to disable it/get close to it. 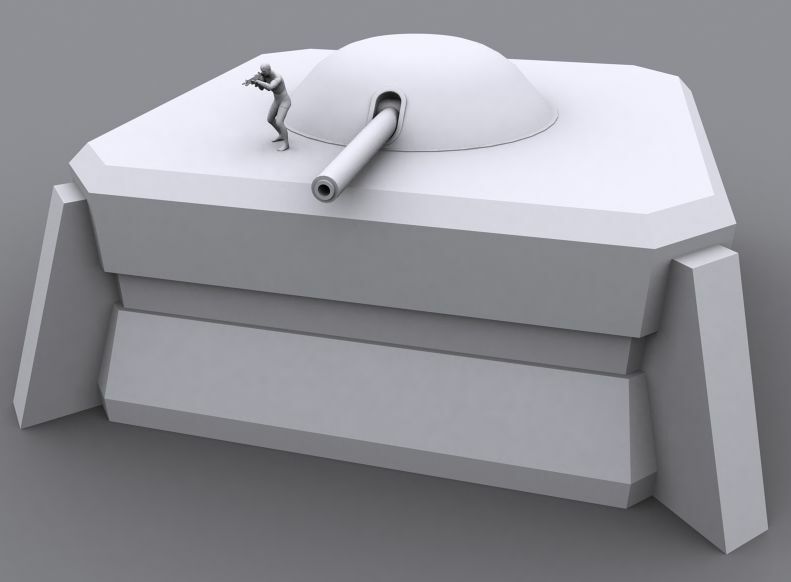 Here you can see prototypes of the fortification system: Reinforced pillbox wallsections - building blocks for the creation of the real pillboxes - and an Earthshaker cannon in armored turret, for a potential artillery fort system. As for the style, a more bare bones concrete look will be used, without the reliefs on it (as opposed to the TT wall of martyrs terrain piece for example). The reason is the same as outlined here in context with vehicle instrument design. The backwater world that is our planet has more pressing needs than to adorne it's pillboxes with skulls, angels and other baubles. Iconography and elaborate detailing is reserved for high value places that do not have to weather artillery barrages. The concepting is far from over (as you can clearly see), and more work needs to be completed before the first structures can be finished and put ingame. Among the blocking tasks are the crew served weapons, that need to be integrated properly into the defense building block system. As you can see, the Hydra now has it's crew placed properly. It also has heavy stubber as front weapon option now (as well as heavy bolter, obviously). This idea came from the FW units, which can often exchange their heavy bolters for heavy stubbers. In tabletop the option is mostly just for flavor, in this mod however both will be very usefull. One has more ammo, flatter trajectory and higher rate of fire and velocity, the other has more hitting power, armor penetration and an explosive effect. This heavy stubber option extends to all Leman Russ and Chimera family vehicles now. In the case of the Chimera troop carrier, we reached a majestic 32 unique different configuration variants (not including camo variants). That's all worthy of showing for now, cheers. 42min ingame video on youtube, showing the mod's state. Holy Emperor, why are you alone on this one ???? you deserve far more attention. Hello! How goes development? Can we expect to see a new showcase video soon? Will you release an early "Beta" for people to download? Also ever considered teaming up with "There Is Only War W40K" modders over at steam? It might cut development time with you two teamed up under a similar goal (to bring Warhammer 40k to ArmA 3). Would you ever add a flamer like with the Burn 'em mod? It makes sense lore wise that a Legio wouldn't be deployed for a planetary rebellion on Samarsk, at most maybe a Knight Squadron is in system and joins late war. Just amazing, will you show off some of the Small Arms too?